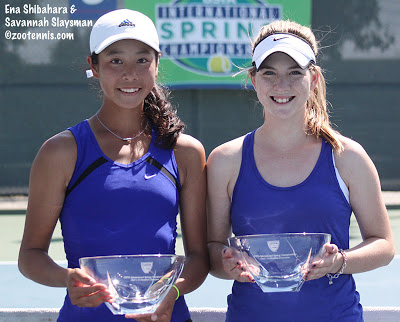 Phoenix-area junior Savannah Slaysman recently had a dream run in Girls' 16s doubles at the USTA International Spring Championships in Carson, Calif., a top lead-up tournament prior to the spring's big jewel, the Easter Bowl. Slaysman (pictured, right) and partner Ena Shibahara (Rancho Palos Verdes, Calif.), ripped through the G16s doubles draw as an unseeded pair. The duo dropped three seeded teams en route to the title, including the No. 8 seeds Caroline Dolehide and Alexis Nelson in the final, 7-6, 6-2. The Slaysman-Shibahara pairing did not lose a set in any of their five main draw matches, and beat the 6, 7, and 8 seeds to claim this Level 1 USTA National and International Tennis Federation (ITF) Grade 1 event, that featured many of the nation's best juniors as well as several top international players. Shibahara also won the singles title, with her toughest match of the tournament being against Kylie McKenzie (Anthem, Ariz.) in the quarterfinals. McKenzie came in as the No. 7 seed in Girls' 16 singles, and reached her appointed seeding, but fell in a tight 2-6, 6-4, 6-4 decision. 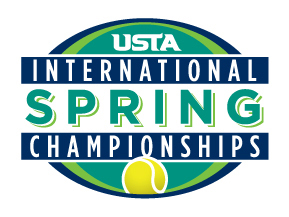 Other Southwest juniors competing in the USTA International Spring Championships included Nathan and James Ponwith (Scottsdale, Ariz.), Delaney Nothaft (Tempe, Ariz.), Maddie Pothoff (Tucson, Ariz.) and Alexandra Letzt (Scottsdale). The event was held at the Home Depot Center in Carson, Calif., one of the three USTA National Training Centers. This week most of the top juniors in the Southwest and the country are competing in the USTA Spring Championships (Boys and Girls 12s and 14s) and the USTA Easter Bowl (Boys and Girls 16s and 18s).